Virtually every day, Earth is bombarded with some 100 pounds of meteoric material. Down come bits and pieces of asteroids, and similar debris composed of rock, iron, and nickel that have been encircling in space for billions of years. When they happen to fall to Earth, rarely is any damage done. Of course, some meteorites have made it into the news, and others, well, at least one did manage to wipe out life on Earth. Like that time some 65 million years ago, when a big piece of meteorite sent the dinosaurs into extinction. But that’s rare. What made the news in 1992, a far less hazardous instance of a falling meteorite, was when a rock the size of a bowling ball crashed into a driveway in Peekskill, New York. With a loud bang, the rock made a crater on a parked orange 1980 Chevrolet Malibu. For its size, the ball was astonishingly heavy, weighing about 28 pounds. Except for the car, luckily, there weren’t any casualties. In the case of the Hoba meteorite, however, which is considered to be the world’s largest known meteorite piece with a weight of some 119,000 pounds–estimated at 66 tons–perhaps the strangest aspect of all is that it left no crater once it fell to Earth. Scientists have suggested that the massive rock apparently slowed down as it penetrated Earth’s atmosphere. It slowed so much that the Hoba reached a point of terminal velocity as it was about to impact the surface where it fell, which was in Namibia. 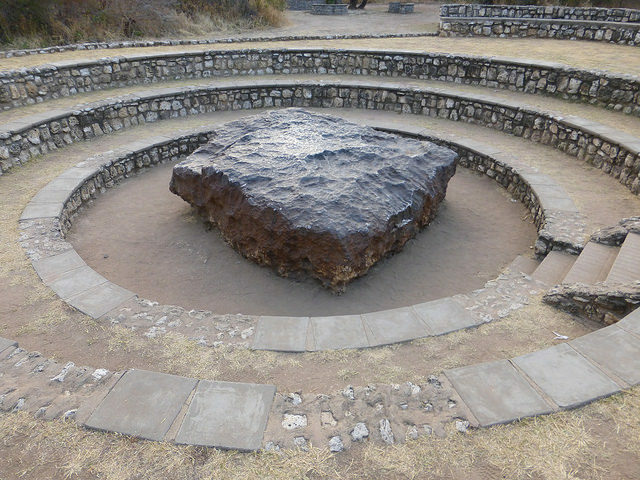 That is why the Hoba meteorite has remained intact. 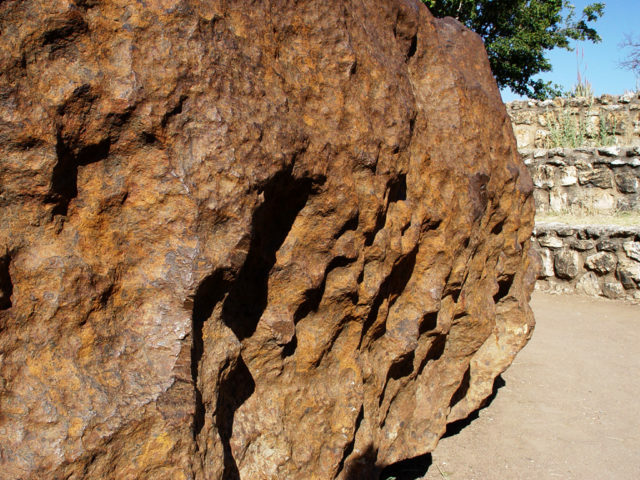 As big and bulky as it is, never in history has this huge an iron rock been repositioned from its “impact” point. While excavated, it hasn’t been moved. 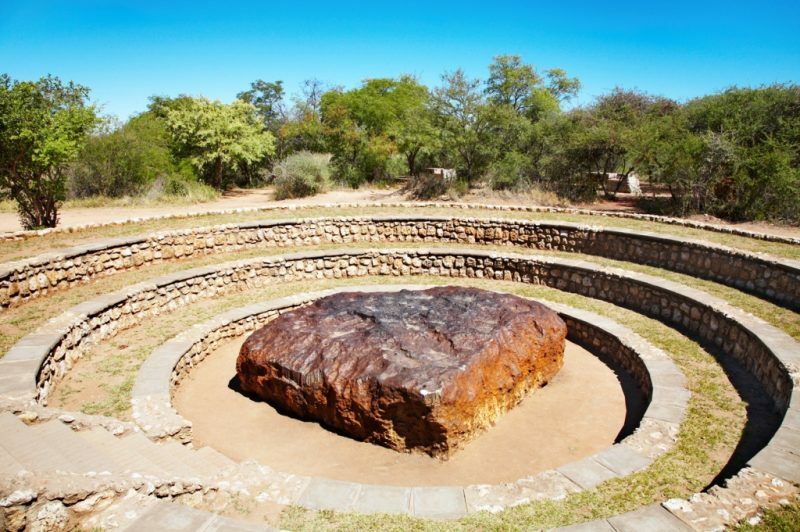 Lurking hidden on a farm in the central-north parts of Namibia, in the proximity of the city of Grootfontein, the Hoba meteorite, or Hoba West as it is also known, was discovered by a farmer almost by chance. The name of the farmer was Hermanus Brits, and he stumbled on the piece in 1920 as he was working at the Hoba farm, which gave the meteorite its name. As Brits described the moment of discovery, it was only the upper part of the rock that was visible. Its color was black, and the soil around it was all chalky. “I scratched the rock with my knife and saw there was a shine beneath the surface,” one of his statements read. After Brits notified local authorities about the find, it was quickly determined that this was a meteorite. The bulky rock is composed of 84 percent iron and 15 percent nickel, and as a type of iron meteorite, it is one of the most remarkable examples ever encountered on Earth’s surface. About 5 percent of the total number of meteorite pieces that fall on Earth are similar in their composition to the Hoba one. They are also massive, but not like this one, at least, not for now. Due to the presence of a rare radioactive nickel isotope, experts have been able to determine the age of the Hoba meteorite, which is estimated at in-between 190 million and 410 million years. And it ended its traversing through space once it fell on Earth a little less than 80,000 years ago. 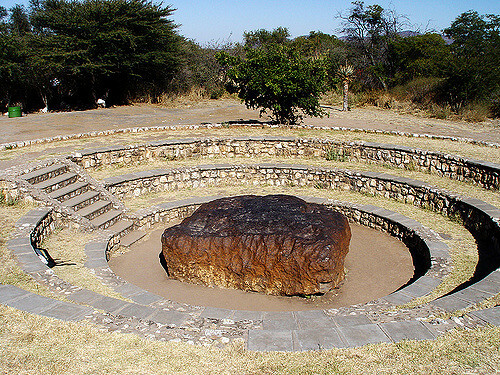 The first significant scientific analyses about this particular meteorite were produced by 1929, and ever since, the megalith has been gaining fame, while also suffering from vandals who have slightly helped shrink the original mass of Hoba. For protecting the enormous iron rock, local authorities have made efforts in protecting it by developing a manageable visitor site around Hoba. The megalith was designated as a national monument in Namibia back in 1955. This status was canceled in 1979 and renewed during that same year as the site surrounding the rock extended. By the end of the 1980s, an information center purposed to educate the public about the meteorite was also constructed on the site. Of course, this is not the first place you’ll think of visiting when planning your next great journey, but hey, where else can you see the largest iron rock on Earth if not here, in Namibia?